Printed words - on screen or on paper - convince and sell! - Derham Marketing Research Pty. Ltd. Recently, we measured the value and the effectiveness of three different to-customer communications channels. The client was concerned about the budget for each – and their value for money. The client had well trained sales executives who cold called, wrote and sent out compelling email content, and sent out a regular newsletter. The client knew the ROI for the sales calls and for the emails, but was unsure whether the newsletter channel worked to generate enough in-bound calls to justify the budget required. We questioned their customers about what channels of information to stimulate query and purchase they saw as most effective and of most value to them. The answer surprised, as the graph shows. 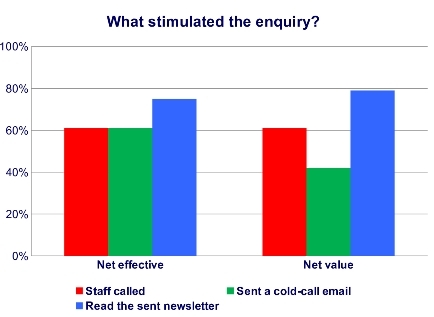 Customers reported that calls in were more often stimulated by the newsletter than by the outbound contacts. So, now knowing what was most effective and most value to their customers, this client can justify continuing their newsletter, and support it with their other channels. And can do so knowing that they are not being old-fashioned, but are giving their customers the information needed, in the style needed, that cost-effectively gets them more enquiries and sales opportunities. This example may be client-specific and industry-specific, but shows the value of testing channels and customer preference to identify your more effective communications approaches in terms beyond the immediate sales response. So, please call, use the contact form or email Philip Derham to discuss how we can help generate a better understanding of your customers’ preferences and responses, if knowing those specific triggers can help you to further strengthen your business. Previous PostMerging what you know with survey answers enables you to sell more effectively.Next PostQuick answers can solve emerging customer concerns.